"The drug store was established in 1847, on Main Street opposite Avon Street, by Dr. Joseph D. Mansfield, a well-known practicing physician, and William H. Willis. 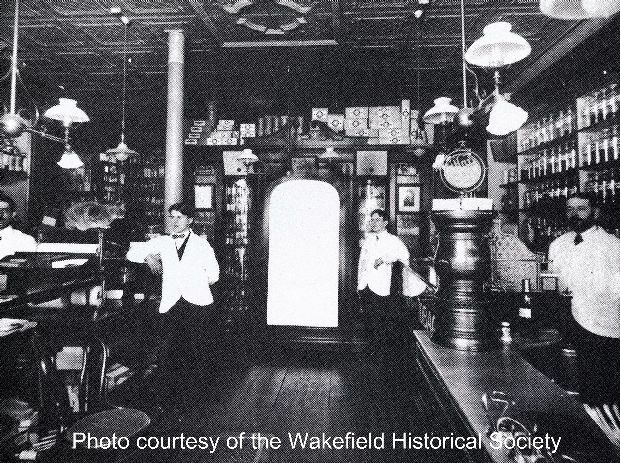 In 1855, Dr. Mansfield purchased Mr. Willis' share of the business, changed the name to the 'Old Corner Drug Store,' and moved to the corner of Main and Albion Streets. The drug store was the second such business between Boston and Haverhill, the other being in Malden. In 1885, Josiah Bonney became a partner and eventually bought Dr. Mansfield's interest in the business. He remained sole owner of the store until 1906, when Riberot Dutton, a clerk in the store since 1896, became a partner. Mr. Dutton was also a registered pharmacist. Mr. Dutton retired from the business in October, 1940, and sold his interest to his two clerks. The wooden building which housed the 'Old Corner Drug Store' was razed in 1940 to make way for Lane's Drug Store." -- Text from calendar by Jayne M. D'Onofrio. Riberot Dutton, Nat Eaton, Ernest Daland and Josiah Bonney (pictured, left to right). “Bonney & Dutton's Old Corner Drug Store, circa 1907,” NOBLE Digital Heritage, accessed April 22, 2019, https://digitalheritage.noblenet.org/noble/items/show/6878.